Disable the frame rate counters on the emulator screen before you capture screenshots that will be submitted to Store. Specify a release build in Visual Studio by following the steps at How to build an app for Windows Phone 8. After specifying a release build, launch your app by selecting the Deploy [app name] link on the Build menu. 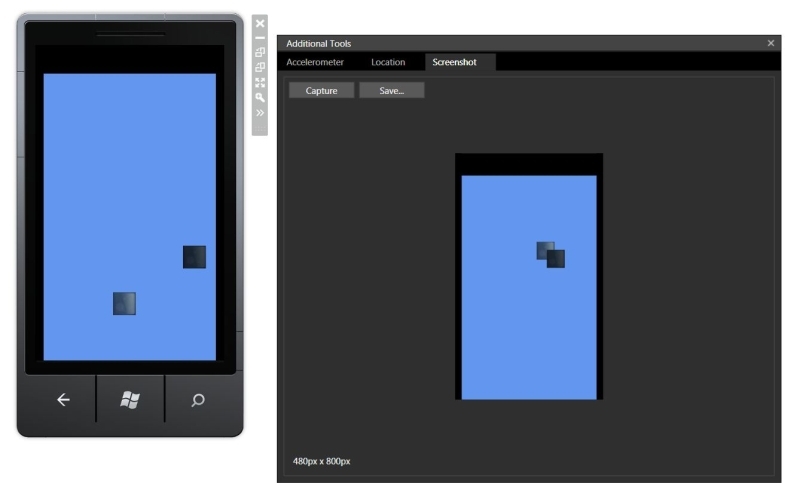 Alternately, you can update your code, as described at Frame rate counters in the emulator for Windows Phone 8. 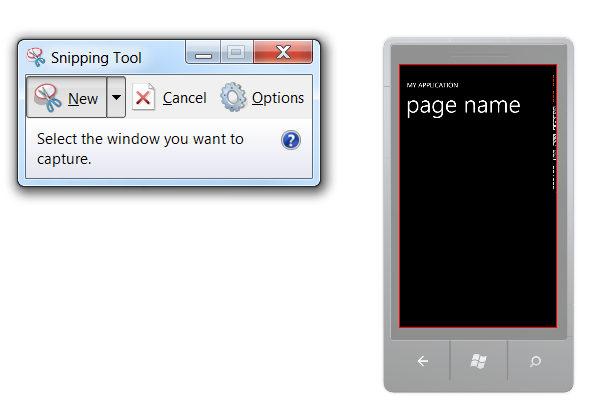 You can create screenshots of your Windows Phone apps by using the built-in emulator screenshot tool. The tool creates PNG files that match the resolution of the running emulator. To optimize the quality of your screenshots, set the zoom level of the emulator to 100 percent. The higher you set the zoom level, the better the quality of the screenshot. For more information, see How to adjust the zoom setting in the emulator for Windows Phone 8. Start your app in the emulator. On the emulator toolbar, click the expand button to open the Additional Tools window. When your app is ready, click the Capture button. The screenshot appears in the workspace. Click the Save button to open the Save As dialog box. Choose the location and File name that you want, and then click Save. Optionally, navigate to other pages in your app and capture additional screenshots. Launch an emulator with a different screen resolution to capture the same screenshots at a different resolution. If you ran your app with debugging, you have to stop debugging before you can run it again on another emulator. You can create your app screenshot easily by using the Snipping Tool feature of Windows®. For more information about this tool, see Snipping Tool. Open the Snipping Tool. You can find the Snipping Tool by opening All apps view and locating it in the Windows Accessories group, or by typing Snipping tool from the Start screen to search for it. Click the arrow next to the New button and then click Window Snip. When you click Window Snip, and then move your mouse around the screen, a red rectangle highlights the different windows on the screen. Move your mouse over the emulator until a red rectangle highlights only the app screen (not the entire phone) and then click. The screenshot is captured and opens in the Snipping Tool. In the Save As dialog box, choose the location and File name that you want. In the Save as type list, click Portable Network Graphic file (PNG). Then click Save. You can also capture screenshots of your app deployed and running on a Windows Phone 8 device. Press the Power button and the Start button at the same time. You hear the shutter sound, unless you have disabled it, and you see the message Saving to Screenshots at the top of the screen. The screenshot is saved in an album named Screenshots.